Meow Wolf in Santa Fe, New Mexico, is hard to find words for. They describe it as an "immersive art installation" which covers it broadly. And maybe broadly is the only way it should be covered. Words don't do it justice. Pictures don't do it justice. I didn't take more than a couple pictures inside of it because I knew they would end up a pale reflection. Meow Wolf is one hell of an installation. Upon entry you are suddenly in a rather strange, surprising environment. As you go deeper, it just gets stranger. There are a lot of surprises waiting for you. Let it take you and you will feel like an explorer of a creative pocket of reality unlike any other. And it is immersive. Nothing within is half-assed. This is a bonafide, whole-assed multidimensional flow of artistry. To call it impressive is an understatement. It is awesome, in the traditional definition of the word. It's mind-boggling how it was even planned and built. You've noticed by now that I've been vague on details. This is because Meow Wolf is probably best experienced without knowing what is inside the walls of its former-bowling-alley home. Seriously, just visit it if you're in the geographical neighborhood. Give yourself some time to visit it. At least a few hours or more. Or look at their event schedule and see a music show there. It's a good venue for that too, and you'll be able to explore (a little bit of) the place before the show! Good footnote, George R. R. Martin is a big donor & helped take this place from low key DIY music venue to what it is now. Hah thats awesome. I figured there had to be some major money involved. I like the guy a bit more now! follow up! 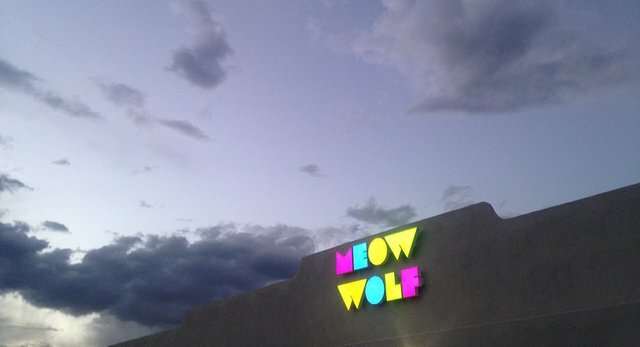 Meow Wolf is building a Denver CO (my hometown!) outpost. 3x bigger than the Santa Fe location. Whoa, I'll hold out a sliver of hope they'll get to building one here too. No chance for me to see it, unless someone bought me a plane ticket. It is amazing how many interesting things I read about in this few days I m on Steemit, and would probably never hear about if I wasnt. Meowwolf is one of them. Thank you. I was surprised to search Steemit for Meow Wolf and find nothing, so I had to make this post. Glad you've learned about it. As vague of a description as it was, I'm convinced. Going to Meow Wolf. hmm, I'm planning a motorcycle trip out west this summer. I can add this to my list of reasons to veer south during that trip. Thanks. Might have to check it out when I am down that way in a few weeks. I see they have a food truck also, have you tried the food? They had a taco truck out front when I visited, which made some pretty damn good al pastor :) They are called Taqueria Gracias Madre. Looks like their own food truck is something new. I'd go just for that name! Haha it's an interesting label for an interesting* place. The first "Beerland" on Vice has a brief segment on this place; it looks so cool. Right, maybe not my thing but there's a lot of people that will love something like this and realize it's exactly what they wanted. What is your advice to all steemians? @pfunk: My advice is to post persistently, without too much regard for rewards. Grow a following. Make thoughtful comments. Find connections with people. Understand your own unique value and express it. I've been shifted to the lottery viewpoint. Flag removed, followed. Sure this post might not have that much value to me but the way steem it structured and your consistency = you getting a good payout every now and again. I agree entirely with your statement. Well, you could always make your own! Only immersive experience can appreciate the beauty of the land! Very intriguing description. Since I hardly ever visit Mexico, I decided to see shots of this place... and it made me think that I should to try to get to Mexico to see it with my own eyes. Never been there but I have done my fair driving through New Mexico! Cool. I just moved to Taos NM. I'll have to check it out. Yeah, just a little drive away! Good job! I like how you do everything qualitatively! In this case you are a professional. Well done! There will be time to look at my post in which I mentioned you. I will be very happy! I followed you. If you like my work, then I will be glad to see you and to celebrate in my circle. Thank you! Did you travel to Mexico by a car or you flew there. I am just curious. Great place and interesting show. It seems worth to see it. Thank you for sharing I would like to see more of yours. I follow + upvote + resteem. You welcome to follow me as well. Have a splendid day. I really liked the design. I will definately want to check this out. Oh my god, where were these people when I was in the states? If I ever go back I want to live here. I will have to check this out. My parents actually own some property in Santa Fe and I used to go there every-year. Haven't made it back there in quite sometime. Will have to check out this mystery haha. Sounds interesting. I would love to see that. just from the photos it looks interesting. i love places like that. These are my type of peeps! Great one . Nice place to visit . I wish I could visit this place . This sounds really interesting! Thanks for sharing this! Never heard of it. Thanks for posting!